While cybersecurity solutions struggle to keep up with increases in fraud, FIs find themselves inundated with disputed transactions—particularly when large breaches occur. 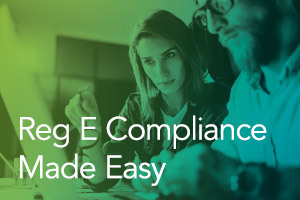 Making matter worse, many FIs are using outdated, labor-intensive, paper-based dispute management processes that leave no audit trail for Reg E compliance. Craig Everett of Centrix Solutions discusses this challenge and offers a way to “go paperless” that will streamline back-office operations and make compliance easier.